Fiber Content: 100% Hi-Bulk acrylic. Microboa-Sherpa Blanket by MV Sport. Super soft and cozy! Hiram College Throw depicting your favorite mascot! Made in the USA by Pure Country Weavers. 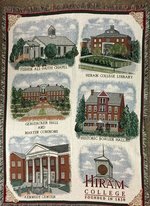 Hiram College Throw depicting your favorite campus buildings!